Thinking of Greece, the first things that come in mind are islands, beaches, deep blue water, archeological sites. There is a hidden gem, though. The art of gastronomy represented by the New Greek Cuisine, blending creativity with love for high-quality local ingredients. 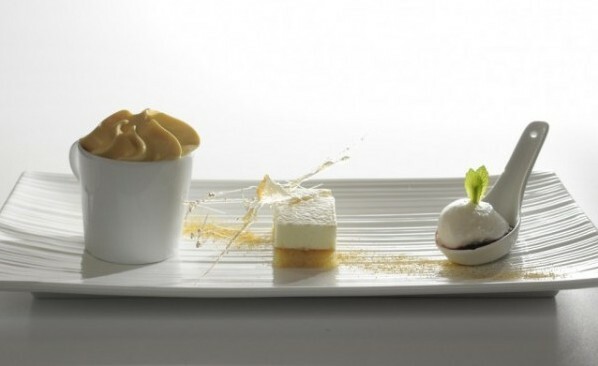 Launched in 2006, Sani Gourmet pays a wonderful tribute to this new gastronomic movement. 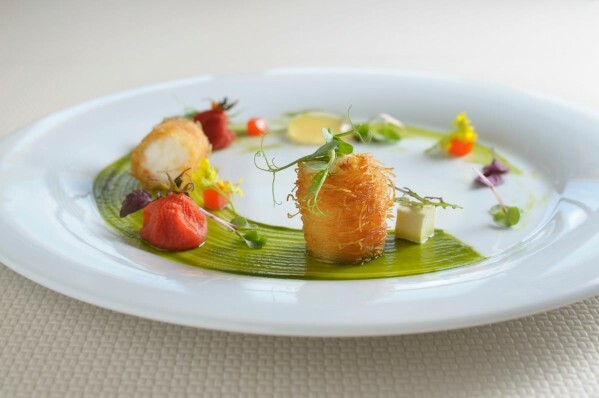 The Festival, taking place in May at the beautiful Sani Resort in the Kassandra Peninsula, has become an important gathering for gourmets coming from all over the world. This year, Sani Gourmet invited fourteen famous Greek chefs, involving them in an interesting challenge: the 100-mile practice, to promote local ingredients of the best quality and further affirming Sani philosophy of sustainable development. I was fortunate enough to attend the first days of Sani Gourmet and was impressed by the creativity of the New Greek Cuisine, as well as by the sparkling vibe I felt around me. Sani Resort is the perfect place to organize a gastronomy festival. Set in a lush ecological reserve in a beautiful area of the Halkidiki peninsula, it includes 15 restaurants ranging from the traditional Greek Taverna to fashionable, high-class venues. 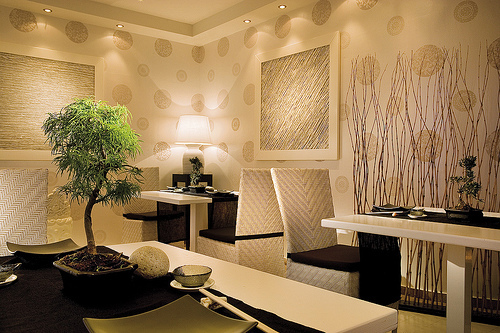 Among these, 5 restaurants were chosen to host Sani Gourmet for their enchanting environment and excellent service. My gastronomic journey started at the stylish Sea You Up Restaurant, where Chef Hervé Pronzato, one of the prominent figures in European cuisine, proposed a 9 courses meal showcasing his ability in molecular cuisine and the superb aesthetic of his dishes. It was my first approach to molecular cuisine, and I was extremely curious. While I felt captured in admiration for the beautiful presentation – miniature sculptures exquisitely arranged and enhanced by a delicate chromatic combination – I soon discovered that a full appreciation of molecular cuisine requires time, as the taste and texture are very unusual. 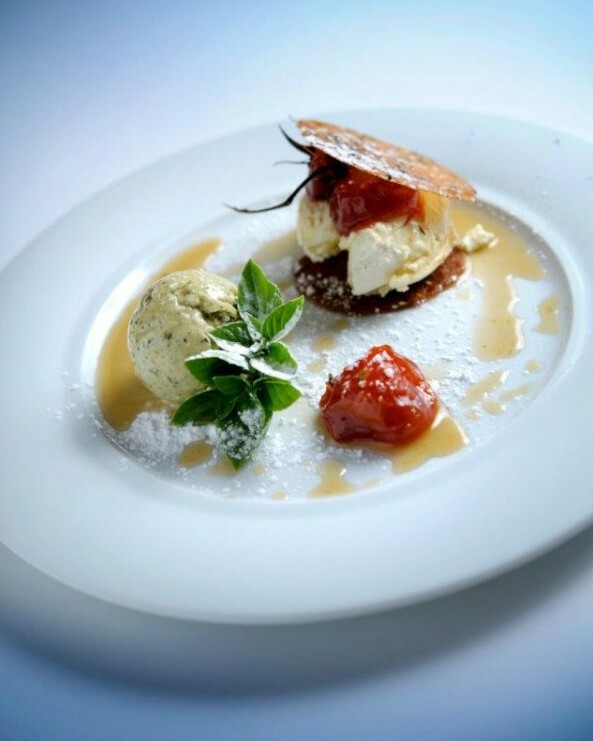 My favorite dishes were the lemon granite, the excellent baked veal cheek, with home-made pasta, pumpkin and truffle from Halkidiki and, above all, the declination on tomato and basil served as a dessert, a very unusual and interesting combination of flavors. The following day, I attended a degustation of cheese and wine from Santorini with Chef Yiorgos Hatziyannakis. During the degustation, the chef discussed the peculiarities of the products with journalists and despite I could not follow the conversation – everyone was speaking in Greek – I could feel the passion, pride and maybe also a little hope that the good things (and there are many) of this troubled nation will attract tourists to their homeland and help them recover. Between my gastronomic experiences at Sani Gourmet, Chef Chrysanthos Karamolegos is the one who won my heart. 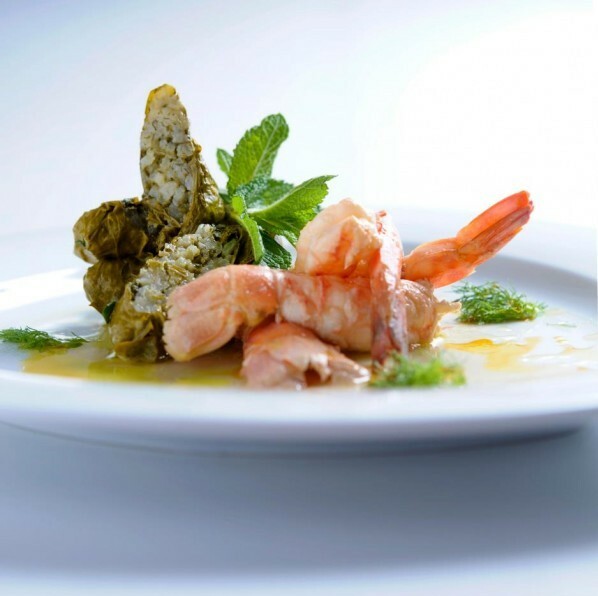 Regarded as the most prominent figure of creative Greek cuisine, Karamolegos proposed at the lovely Restaurant Tomata a menu blending the traditional Greek and Mediterranean cuisine with a touch of creativity, resulting in a perfect balance of flavors. We started with three mouth-watering appetizers: marinated anchovies with sea asparagus and fennel, followed by the sun-dried grilled octopus with cherry tomatoes marinated in syrup with ginger and finally anjoulada, a paste made of sardines, anchovies, figs, almonds and black olives. The menu continued with the traditional stuffed vine leaves, perfectly reinterpreted in a contemporary fashion, a savory fish soup from Aegean, a modern version of souvlaki (pork skew), closing with an unforgettable dessert, called ‘tomato spoon sweet’, made of delicate basil ice-cream, white and black sesame cake and cherry tomatoes in syrup. I felt like I was in heaven. Although I consider myself a hearty eater (I’m Italian!) I’m far from being a food expert but the impression I gathered is that the cuisines by Chef Chrysanthos Karamolegos and Chef Hervé Pronzato couldn’t be more different. 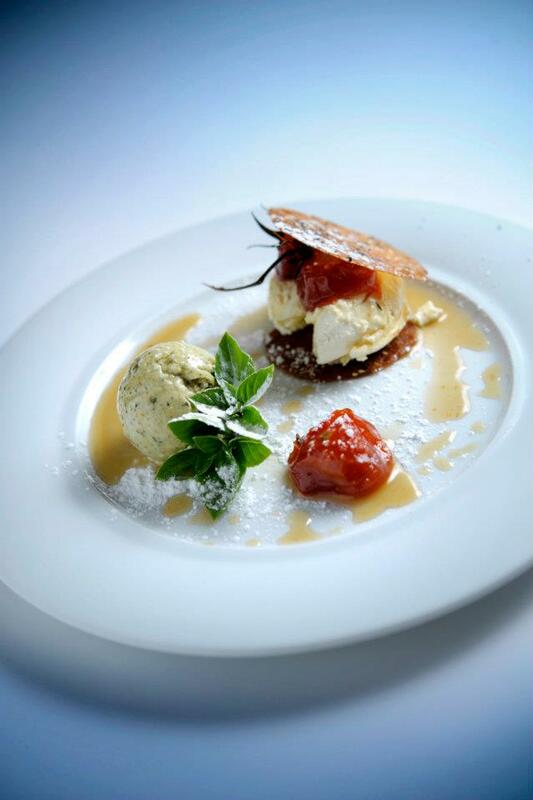 Pronzato is a real master in aesthetics and his dishes are the result of a great chemical mastery. The result is certainly very interesting, however I can’t help thinking at it as an ‘intellectual cuisine’. Karamolegos dishes, instead, are emotional, they come from the heart and very little from the brain. I recognize that I might need time to get more familiar with molecular cuisine to appreciate it as it deserves. For the time being, however, I know that the degustation menu by Chef Chrysanthos Karamolegos was an experience I will remember for a long time. Besides Sani Gourmet, taking place every year in May, Sani Resorts organizes the Sani Festival which goes on throughout July and August. The open-air event celebrates music ranging from classical to jazz, ethnic and folk in the beautiful backdrop of Sani Hill. Note: I was kindly invited by Sani Resort to discover the New Greek Cuisine represented at Sani Gourmet. Since I was the one savoring this awesome food, the opinions expressed are based on my very personal culinary taste. More reading: Wild About… Crabs! Ah, I see you are a foodie as much as I am. Lovely review and photos! I stayed in Greece once when I was a teenager and fell in love with the food, particularly the feta. Sani Gourmet was a fabulous discovery, because it taught me that Greek cuisine is much more than feta, gyros and moussaka (although I love them all). So glad you share my passion for food, Charu. Talking about best summer vacation resorts, Greece is everything you would dream about and much more. Santorini particularly, is something extraordinary. The white cobble-stoned roads abound with cafes, resorts, souvenir shops and taverns. Purity, mystery and indescribable beauty are entwined in this splendid island. Wandering around, you can really feel the magic of Ancient Greece and sense the bless of the Olympian gods.